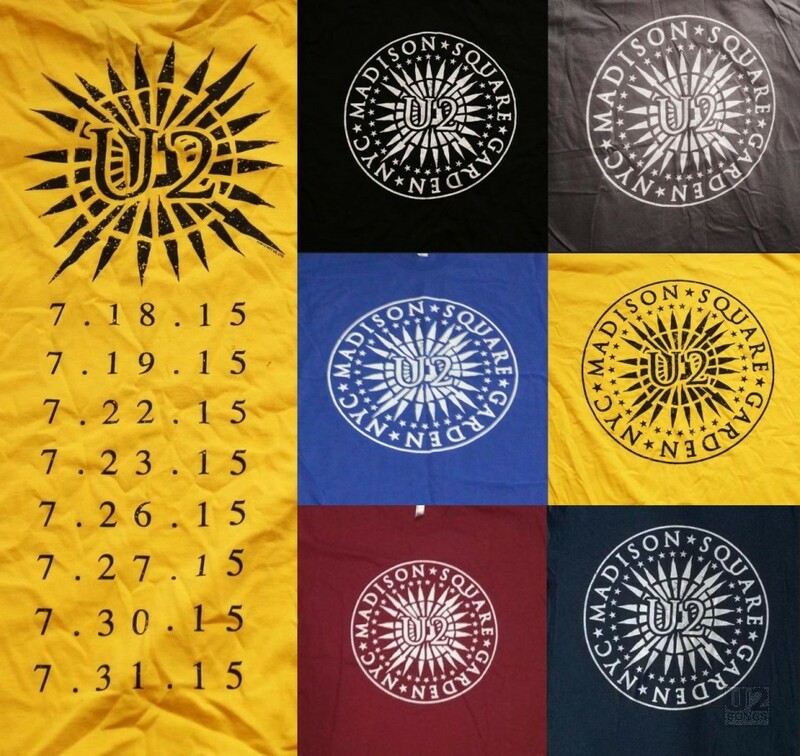 During the #U2ieTour there were a number of city specific t-shirts designed and sold at the shows. In some cities (Chicago, Boston) the T-shirt was one colour that was sold each night. In other cities (New York) the colour was different each night making the T-Shirt unique. And finally in some cities (Dublin, London) the T-shirt was available in multiple colours, but these were random, and it seemed that multiple colours would be available on any night depending on availability. The first of these t-shirts was from Chicago. 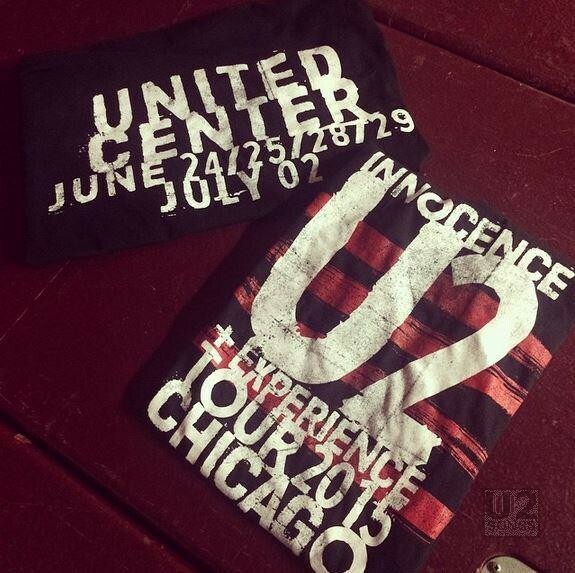 The front of the T-shirt had red stripes over which was written “Innocence U2 + Experience Tour 2015 Chicago” and on the back was the venue, and the four dates in white print on a black t-shirt. The next shirt to be seen was in Boston. 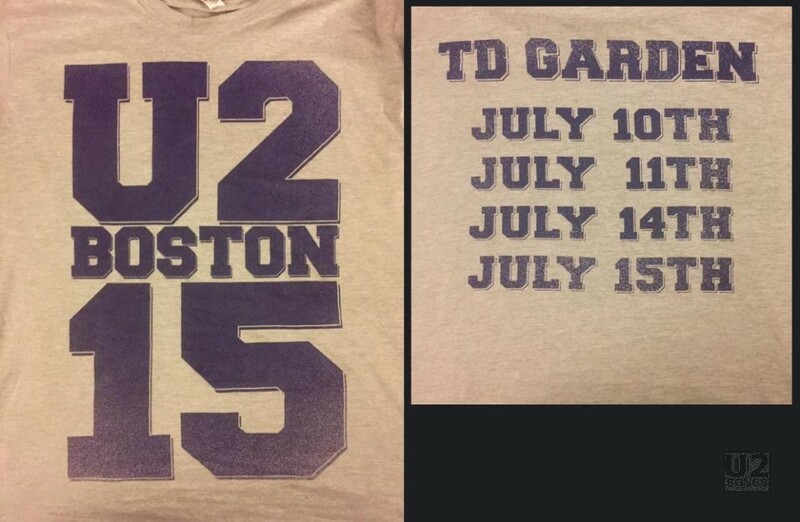 The front of the Boston t-shirt was done in a style to reference old collegiate shirts, and lists “U2 Boston 15” and on the back is listed the venue and the four dates. In New York each night meant a new shirt, but they were all in the same design. The logo on the front was done to resemble an older Ramones logo, and included Larry’s tattoo in the middle and listed “Madison Square Garden NYC” around the outside of the logo. On the back was the tattoo image again, followed by the listing of all eight dates. For the first night the bright blue shirt was sold, followed by the yellow on the second night. On the third night the navy blue shirt with white lettering was sold. On the fourth night the shirt was olive green with white printing and on the fifth night the shirt was white with maroon printing. (both of these not pictured) The black was sold on July 27, the light grey on July 30, and the red / burgundy was sold on the final night, July 31. The T-shirt for Amsterdam was a different colour on different nights. 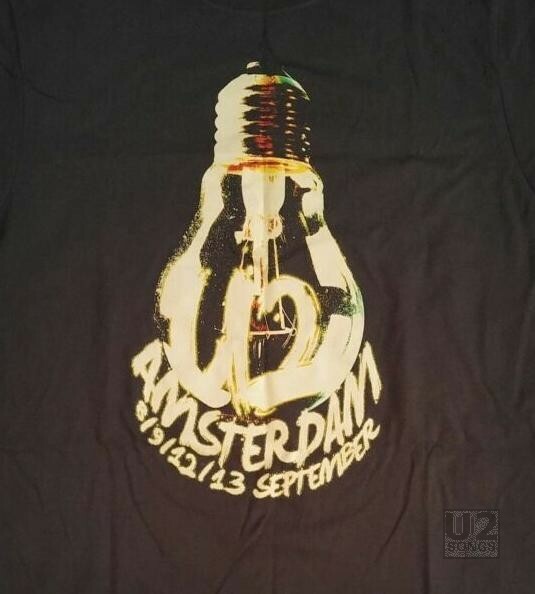 The shirt featured a lightbulb with a U2 in the center on the front, with the city name, and the dates below. These came in navy (night 1), red (night 2 and 4) and grey (night 3). The T-shirts for London were available in different colours. They featured a print on the front of the shirt which listed all six dates. They were available in navy (picture 1), and grey (picture 2) as well as brown and black (picture 3). The shirts weren’t necessarily specific to one specific night as can be seen from the photo of the black one and the brown one being sold together. There was also a burgundy one. It is not known if other colours were available. The first two shows in Paris had the same shirt available, featuring a large print on a black shirt. 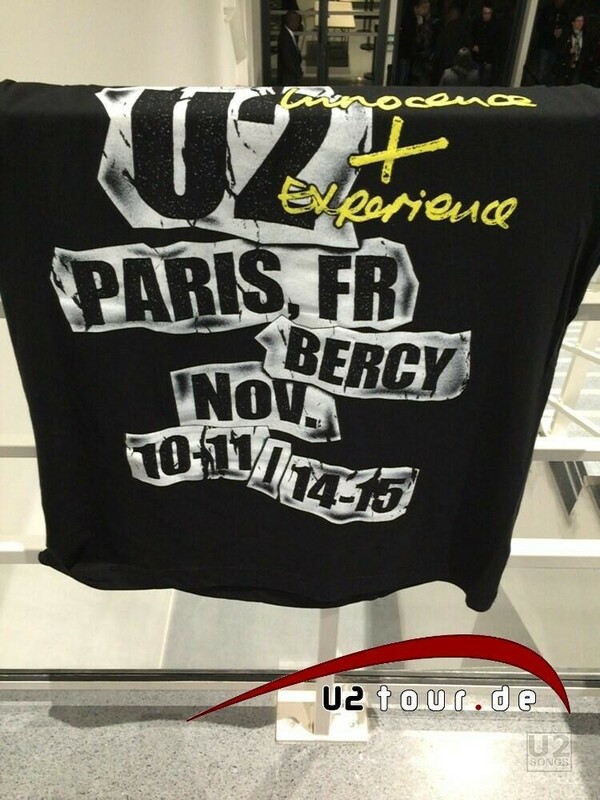 “U2, Paris Fr, Bercy, Nov 10-11/14-15” is in black on a white background. 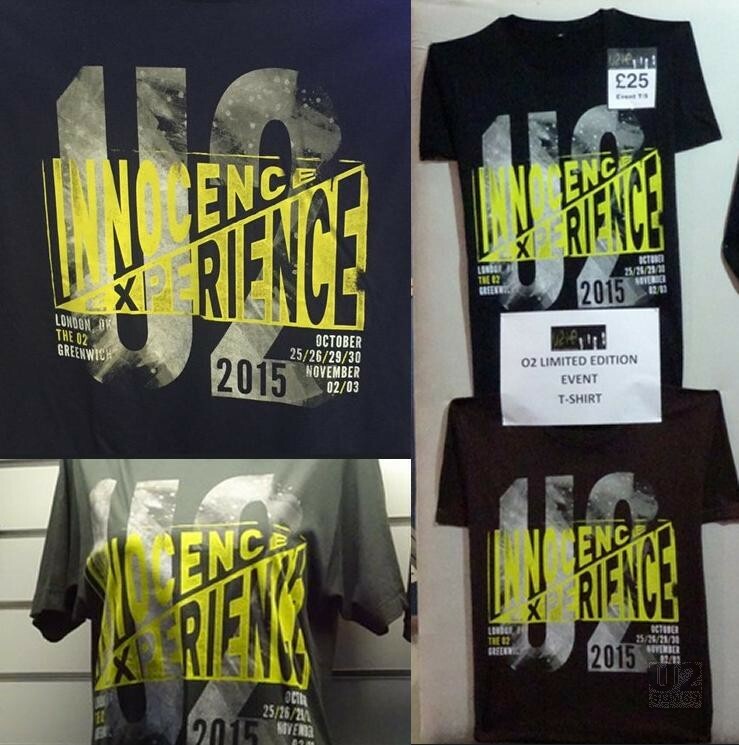 While “Innocence + Experience” was in yellow. Although all four dates are listed, U2 did not play the second set of dates on November 14, 15 due to the attacks in Paris. 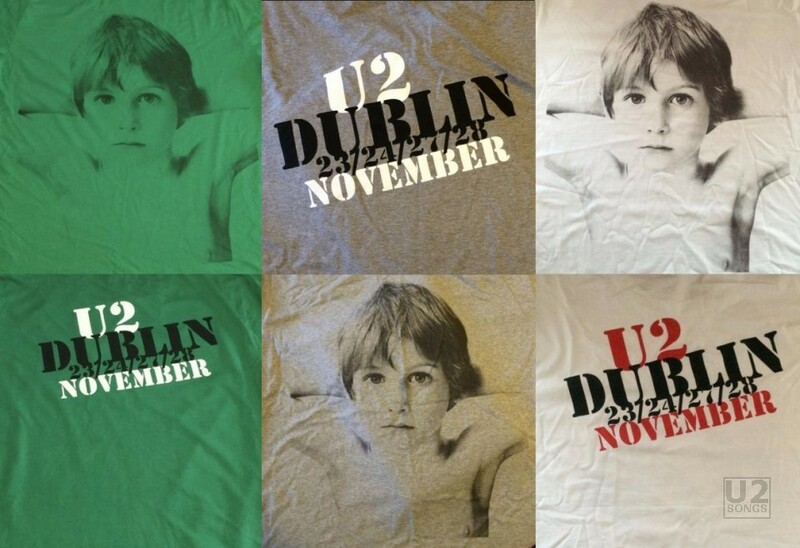 The Dublin T-Shirts were available in different colours, and multiple colours were sold each night. They featured the image of Peter Rowen from the cover of Boy on the front, and featured “U2 Dublin 23/24/27/28 November” on the back. Along with those colours pictured above there was also a red shirt available which is not pictured. There was a second design for the U2 Dublin shows. These alternate T-Shirts were sold at Carrolls Irish Gifts shops in Dublin, and online. The T-shirt came in one colour, black, with a lightbulb design on the front and nothing on the back. 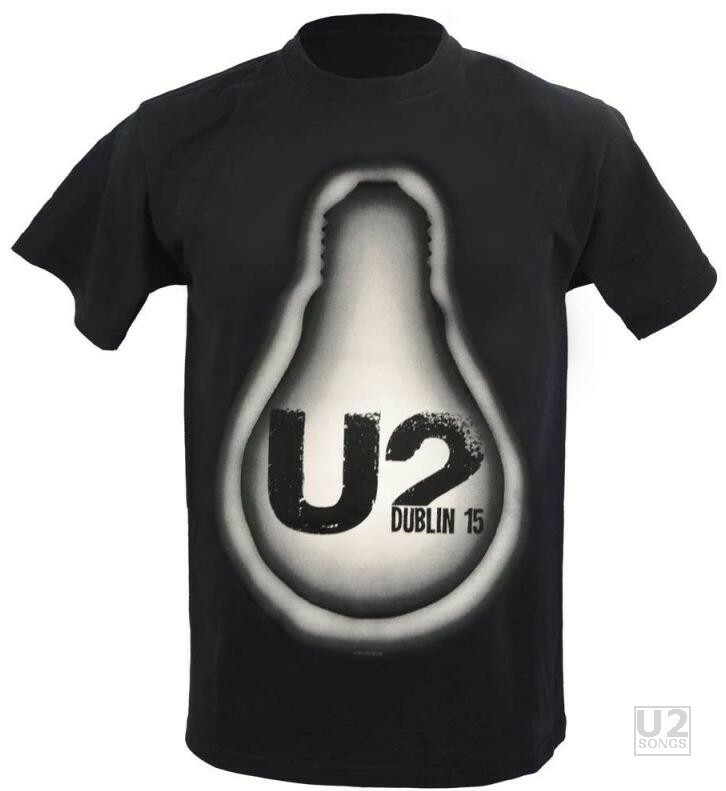 These are official merchandise from the band even if not sold at the shows, or through u2.com. These appear to no longer be available on the website. The final shows of the tour were a rescheduled set of dates for Paris to make up for the shows which had been cancelled in the wake of the Paris attacks. 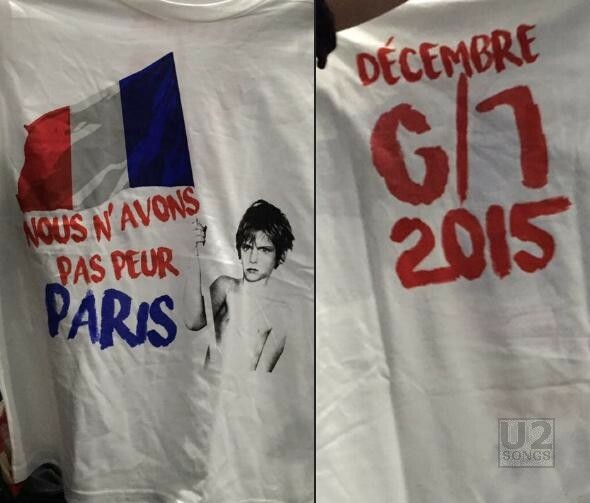 For these new dates, U2 produced one final T-Shirt. On the front it says “Nous N’Avons Pas Peur Paris”, which translates to “We Have No Fear Paris”. This is accompanied with an image of Peter Rowen holding a white flag, which has been coloured to resemble the flag of France. On the back is the dates of these final shows of the tour. Our thanks to u2gigs.com, u2tour.de and u2valencia.com for documenting these shirts in some of the photos used above.